Animax Asia is going to air one of Japan's highly rated anime. 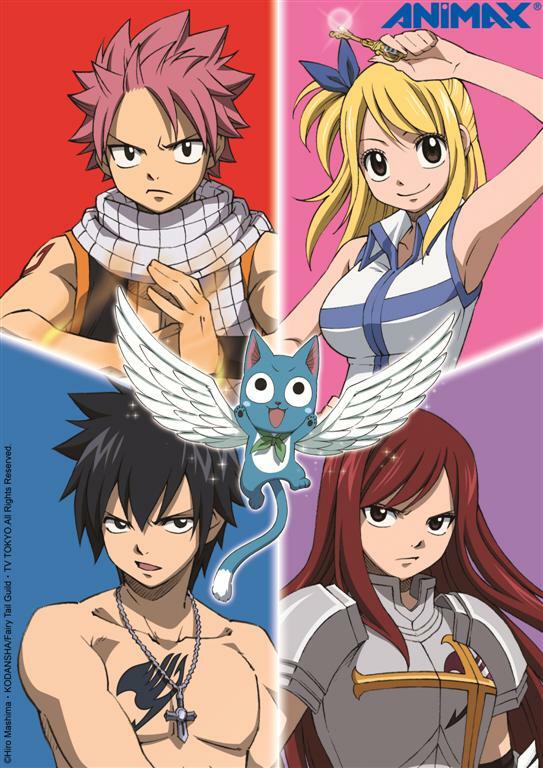 Fairy Tail will premiere on September 30, 2010 and will air every Monday to Friday at 10pm. Set in a fantasy world where magic is the way of life, Lucy had always wanted to join the famous Fairy Tail mage guild and travelled to the kingdom of Fiore in that hope. Along the way, she crosses paths with Natsu and his talking-and-flying cat Happy who are seeking a dragon. Abducted by someone posing as ‘Salamander’ from the Fairy Tail guild, Lucy is then rescued by Natsu who reveals that he is in fact the real ‘Salamander’ with dragon slaying abilities. Offering her membership into the Fairy Tail guild, Natsu, Happy and Lucy then join female warrior Erza Scarlet, and ice mage Gray Fullbuster as a team to embark of various missions for the Fairy Tail guild. Fairy Tail is co-produced by top anime studios A-1 Pictures (Kuroshitsuji, Valkyria Chronicles) and Satelight (Macross Frontier, Hellsing OVA). Fairy Tail features top voice actresses Aya Hirano (The Melancholy of Haruhi Suzumiya, Death Note) and Rie Kugimiya (Shakugan no Shana, Fullmetal Alchemist Brotherhood) as the voices of lead characters Lucy and Happy respectively. wonderful article share to me. nice information on the anime a1 pictures.thanks to shere this article. animation is a good art and i hope this fairy tail animation thanks for sharing this information. wonderful description of the channel animax.